In December 2003, a skinny Iraqi kid, about 14 years old, approached one of the soldiers at the border and said simply, "Arrest me." Jamil, as he was called, claimed to have valuable information about the insurgency, but First Sergeant Hendrex was skeptical; especially when the boy announced that the man he wanted to turn in was his own father. The story that unfolds is one of heartbreaking tragedy, remarkable courage, and unprecedented resiliency, as this child risks everything he knows for a chance at freedom. And after the boy saves countless lives, First Sergeant Hendrex makes it his personal mission to return the boy to safety. 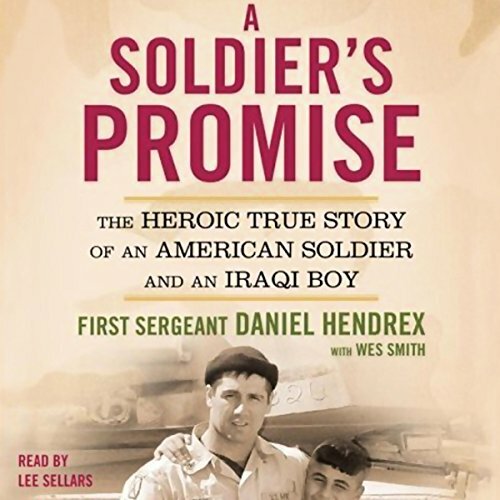 A Soldier's Promise is the astonishing tale of two countries and two very different kinds of people joining together against terror and tyranny, and of the young man who, against all odds, gave Dragon Company what they desperately needed: hope. ©2006 Daniel Hendrex. All rights reserved; (P)2006 Simon & Schuster Inc. All rights reserved. I listened to this book while stationed in Iraq with the Army Reserves. My role did not include operations outside the base, but this book increased my understanding of the soldiers' lives who did. The story is very heartwarming, but also very realistic, to include the boy's difficulties adjusting to his new life after rescue. I recommend it to anyone who wishes to understand better some of the complexities of the Iraq War, in the setting of a captivating story. The narrator made the story come alive. And Stevo is it true hero for all of humanity. It's so difficult to stand for right in any culture. But he was brave enough to stand against his culture for what is truly right!